What makes a good RC Trainer? A good RC Trainer is a stable, self-correcting airplane that can fly at very slow speeds. In other words, it's an airplane that's easy to fly when you're learning how to fly RC airplanes. Let's take a look at some of the key characteristics that make for a superb first airplane. If you're in a hurry you can jump on over to this list of the most popular RC trainer planes. A stable airplane has a naturally tendency to fly straight and level. The position of the wings has huge impact on how the airplane behaves in the air. You've probably noticed that all good RC trainers have top mounted wings. Do you know why? A low wing plane carries the weight of the fuselage on top of the wings where the slightest imbalance will make the airplane naturally want to flip over. As a matter of fact a high wing trainer is more like a surfer on top of a surf board rather than granny relaxing on the swing! If a beginner gets overwhelmed and lets go of the sticks while the airplane is banked, a good beginner plane will self correct back to straight and level flight. This self correcting characteristic is accomplished with wing dihedral. The angle that an airplane's wing tips are pointed upward from the horizontal position is called dihedral. 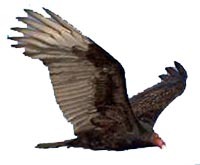 Ever notice how a vulture angles its wings upward while circling the dead animal along side of the road? The stall speed is the minimum speed an airplane can fly before it simply stops flying and starts dropping like a rock. This minimum speed is called the stall speed. A good RC trainer will have tons of lift allowing it to fly very slowly giving the beginer plenty of time to react and learn the controls. This is accomplished best with a flat-bottomed wing. From our previous discussion about how airplanes fly, we know that the type of airfoil has a huge affect on the wings overall lift. On a flat-bottomed wing, the air going over the wing must travel farther than the air going under the wing. This produces much more lift than a symmetrical wing. More lift allows the airplane to fly much slower which gives the beginner more time to react. is an example of a trainer airplane with a flat-bottomed airfoil. Some trainer RC airplanes have semi-symmetrical airfoils. These are a step up from a basic trainer. Since the wings will provide less lift, these airplanes will not fly as slowly before stalling. Semi-symmetrical airfoils will make a trainer airplane much more aerobatic. Hobbico's Hobbistar 60 is an example of a trainer airplane with a semi-symmetrical airfoil. If you think you will be a fast learner and have someone to help you, then you should consider a semi-symmetrical trainer airplane. If you want to be safe and have the easiest RC airplane for learning to fly, then stick with a basic trainer airplane with a flat-bottomed airfoil. Staying on the runway while taking off is serious challenge for beginners. It definitely took me a while to get the hang of it. A steerable nose wheel is much less sensitive to the rudder input than tail draggers. That's why most all RC trainers are equipped with tricycle landing gear where the steering is controlled by the nose wheel. Three bladed propellers are also a good idea to use on your first nitro trainer airplane. Three bladed props provide more thrust to get the plane off the ground faster for a short easy take-off. When using a 3-bladed propeller the top end speed is much slower than a 2-bladed prop giving the pilot more time to react to the airplane. 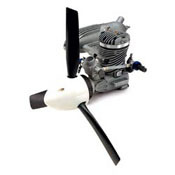 A 3-bladed prop will also slow the airplane down when the engine goes to idle. The diameter of the blades on a 3-bladed prop are shorter than the blades of a 2-bladed prop. This is helps protect the propeller for those first landings, and they generally are rough ones! Be sure to check out this extensive list of the most popular trainers on the market. If the RC trainer airplane you're interested in meets this criteria, you can rest assured that you are buying a good trainer aircraft.